​​​ KILLEEN – A handful of new retail stores are expected to open later this year. Aldi will open it’s second location in the area for an estimated $1.2 million and will be at 3501 W. Stan Schlueter Loop. 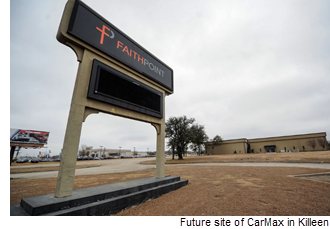 CarMax will be moving to the vacant Faith Point Church, sitting on 4.7 acres, at 3504 E Central Texas Expy. Pet Supermarket will also be a sizable addition to the city, with an estimated 15,204 sf. at 2602 Trimmier Rd.